Have you ever heard of the Baron Ranch hiking trail? Most folks haven’t, but it’s a fine public trail a couple miles west of Refugio State Beach and it’s worth exploring. Pronounced Bear-own Ranch, the beginning of the trail runs through a 1,000 acre ranch owned and managed by Santa Barbara County. The land the Baron Ranch Trail is on was purchased by the county from Rudolph Schulte in 1991 to serve as a buffer between the Tajiguas landfill and the neighboring properties. The Baron Ranch Trail is the first new trail to open on the Gaviota Coast in decades. It starts out on an easement through a working avocado and cherimoya ranch, then follows a 6 mile loop trail. It was a project 10 years in the making and relied upon a grant from the Goleta Valley Land Trust plus a lot of volunteer work. While we like to think of the Chumash as living idealistic perfect lives of leisure, the reality was they had feuds with their neighbors, and battles happened frequently. In fact, journals from the 1770s describe the Chumash living at Dos Pueblos as “troublemakers” and witnesses describe seeing them with scalps from those they had killed. 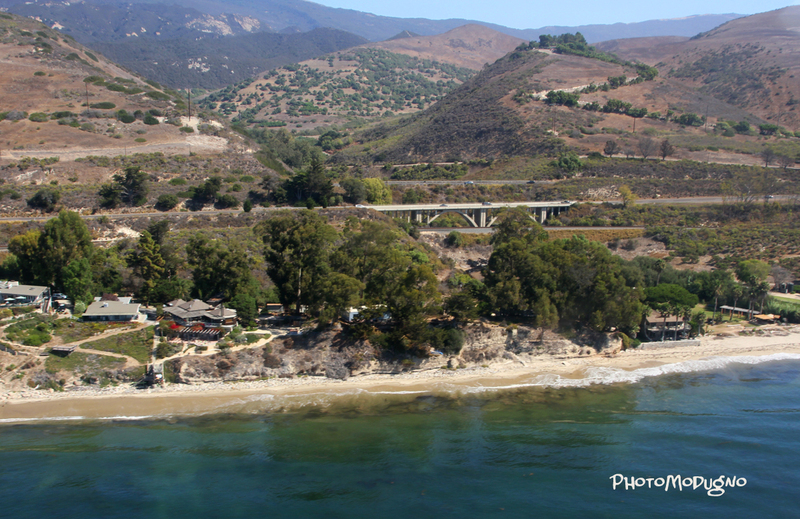 The Dos Pueblos Chumash were battling the Chumash from the Goleta Slough so regularly, the Spanish military originally considered putting the Santa Barbara Presidio between the two villages to keep the peace! One night, natives from Dos Pueblos came to the Baron Ranch area, to the Chumash village there called Shishuch’i’. In the dead of night, they silently set fire to all the huts, burning down the whole village and killing many people while they slept. Not long after that, the spot was referred to as La Quemada (the burned place) by Spanish missionary Father Fermin Lasuen and it was recorded as such, so the name was on the “official records” as far back as 1794. A few years later, the village known as Quemada was resettled by mountain Chumash (people from the Santa Ynez Valley region), and records show the village population to have grown to 250 people! Rancho Nuestra Señora del Refugio was granted to José Francisco Ortega in honor of his service to the Spanish Crown. The 26,000 acre parcel stretched from Cojo Canyon to Refugio Canyon. After his retirement in 1794, he built his home in Refugio Canyon. When Mexico took over California, the grant was confirmed to the Ortega family. The Quemada name appears on the diseno for the Refugio land grant from Mexico in 1838. Jose Manuel Ortega, one of the Ortega sons, sold the west half of Quemada Ranch out of the Ortega family in 1863 to Auguste Mougard for $500. This was during the Great Drought, so the Ortegas were probably in need of cash like most of the other cattle ranchers. In the years that followed, the Arroyo Quemada passed through several hands besides Mougard, including Bruno Orella and Lawrence More. Eventually, it ended up in the possession of Pedro Baron. This is where the name Baron Ranch comes from. Pedro Baron was Basque, a native of France, born in 1829. He came to the United States via San Francisco around 1860. He first settled in Las Cruces, a small town near Gaviota that no longer exists. There he raised livestock and ran a store. In 1872, he bought the Quemada Ranch and continued his retail business there. The Quemada Ranch came with an old one bedroom adobe, built by the Ortegas in the 1820s. The one room adobe was conveniently located right on the Camino Real, perfect for a retail operation. Baron added on to the adobe and catered to weary travelers, stage coach passengers and fellow ranchers. This is how it looked in 1883. Amazingly, this adobe still exists today and is still being used as a private residence by the Meyer family, direct descendants of the Baron family. Please respect private property rights. Mr. Baron must have been doing pretty well financially, because he also bought a townhouse in Santa Barbara. It was actually an old adobe that had once been a barracks for soldiers at the presidio, known as the Caneda Adobe. He later built a nice Victorian style house in front of it, that stayed in the family until 1945. This prevented the old Caneda adobe from being demolished, and so it also still exists today, in the restored presidio on East Canon Perdido Street. The Baron family ranch at Quemada was mainly a cattle operation, but they also raised horses and grew walnuts. Pedro and his wife, Altagracia, had 6 children, 3 daughters and 3 sons. The sons, Dominic, born in 1868, Pierre,1874 and Gerard,1877, all worked on the ranch. Pedro passed away in 1914 from old age and in his will he left the Quemada Ranch to his 3 sons, split evenly 3 ways. Pedro was buried at the Calvary Cemetery in Santa Barbara. This map from 1921 shows how the ranch was split between the 3 Baron brothers. Each of the brothers managed their respective parcels differently. One of the parcels had a granite quarry on it that provided the base for a lot of the roads in town and it was nicknamed “Baron Base”. The oldest Baron brother, Dominic, enjoyed gambling. One evening in 1927, he had a real bad run in a poker game up at Cold Spring Tavern and he fell pretty deep in debt to a fellow named Norman Jensen. Like a lot of ranchers in the area, Baron was most likely land rich and cash poor, so rather than pay Jensen in cash, he deeded him the ocean front land. The amount on the deed was $12,000. A big chunk of change back then, but a bargain for this choice piece of real estate. Today there are 13 residences in a private, gated community, on what’s now known as Arroyo Quemada Lane, and the Jensen family still owns a home there! This is Gerard Baron, the youngest son. He and his brothers all eventually moved into town and leased their land out to others to ranch, like the Allegria family. Gerard sold his share of the ranch in 1931 and retired in Goleta. The other brothers sold their portions of the ranch at different times. In 1966, the county bought part of the old Baron Ranch to make the Tajiguas Landfill. The portion that is now the Baron Ranch Trail left the Baron family lineage in 1971, when the Meyer family sold it to Rudi Schulte. In 1991, Schulte sold it to the county for the landfill buffer. What we call the Baron Ranch today is located approximately 25 miles west of Santa Barbara, is just over 1,000 acres and is managed by the County Public Works Department. The beginning of the trail goes through orchards, but eventually you get into the wild, undisturbed native habitats in the northern reaches. The County hopes to extend the trail through the Los Padres National Forest to West Camino Cielo at the crest of the Santa Ynez Mountains, with connections to Gaviota State Park. It is currently open only to pedestrian users, Saturday through Monday of each week from 8:00 a.m. to dusk. So thanks to the Baron family for taking good care of this land. Hopefully this will be the first of many public trails in the Gaviota Coast foothills! Sources: Santa Barbara Historical Museum, Noticias, Michael Redmon, Justin Ruhge,”History All Around US”, John Ryan Fischer, Songs of the Wilderness, Santa Barbara Independent, Santa Barbara News Press, History of Santa Barbara County- Thompson and West, Gary Meyer, John Johnson, Santa Barbara Trails Council, Santa Barbara Museum of Natural History, Rick Jensen, SB Genealogical library, Laurie Hannah, Santa Barbara Trust for Historic Preservation, Lael Wageneck, Santa Barbara County, Public Works Department, “Quemada Bob” Drury and special thanks to Mark Wilkinson.